Original works have been premiered by the Kiev Philharmonic, Colorado Youth Symphony Orchestra, and Cal Poly MIDI Ensemble. 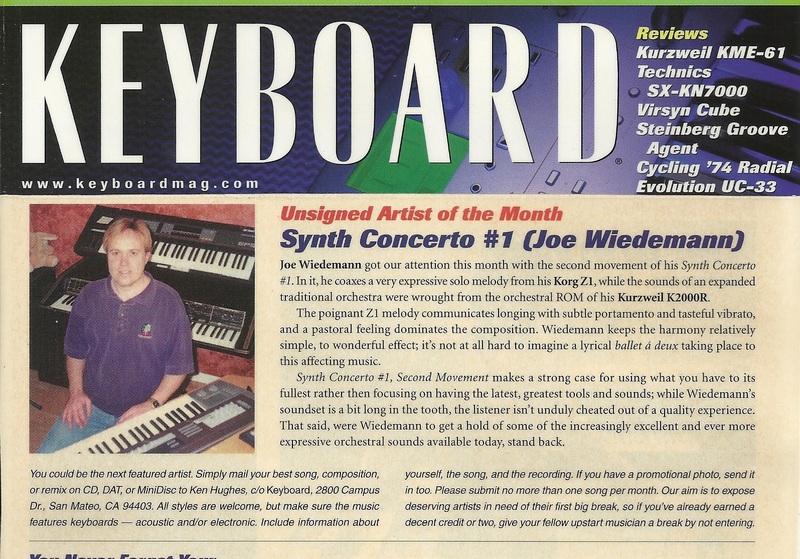 Joe Wiedemann got our attention this month with the second movement of his Synth Concerto #1. In it, he coaxes a very expressive solo melody from his Korg Z1, while the sounds of an expanded traditional orchestra were wrought from the orchestral ROM of his Kurzweil K2000R. The poignant Z1 melody communicates longing with subtle portamento and tasteful vibrato, a pastoral feeling dominates the composition. Wiedemann keeps the harmony relatively simple, to wonderful effect; it's not at all hard to imagine a lyrical ballet a` deux taking place to this affecting music. 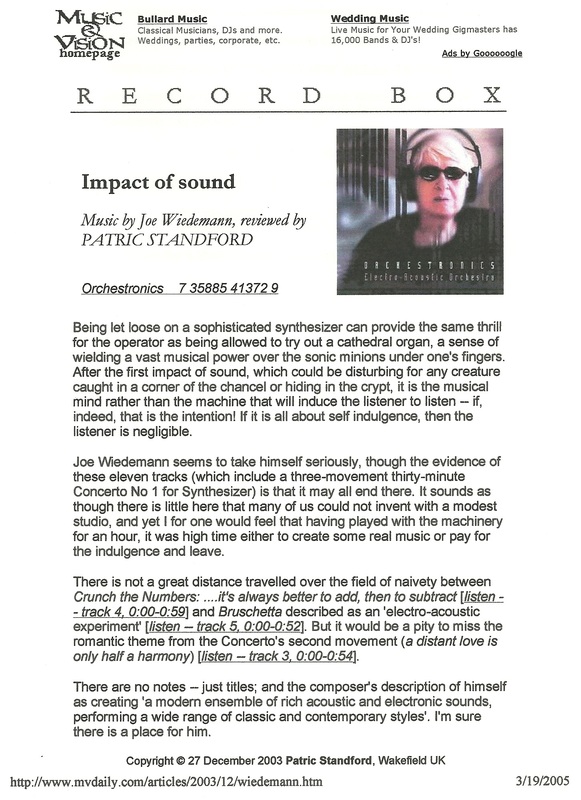 Synth Concerto #1, Second Movement makes a strong case for using what you have to its fullest rather than focusing on having the latest, greatest tools and sounds; while Wiedemann's soundset is a bit long in the tooth, the listener isn't unduly cheated out of a quality experience. That said, were Wiedemann to get a hold of some of the increasingly excellent and even more expressive orchestral sounds available today, stand back. Award- "Distant Melody" wins "Best Keyboards"
...But it would be a pity to miss the romantic theme from the Concerto's second movement (a distant love is only half a harmony) [listen -- track 3, 0:00-0:54]...the composer's description of himself as creating 'a modern ensemble of rich acoustic and electronic sounds, performing a wide range of classical and contemporary styles'. I'm sure there's a place for him. 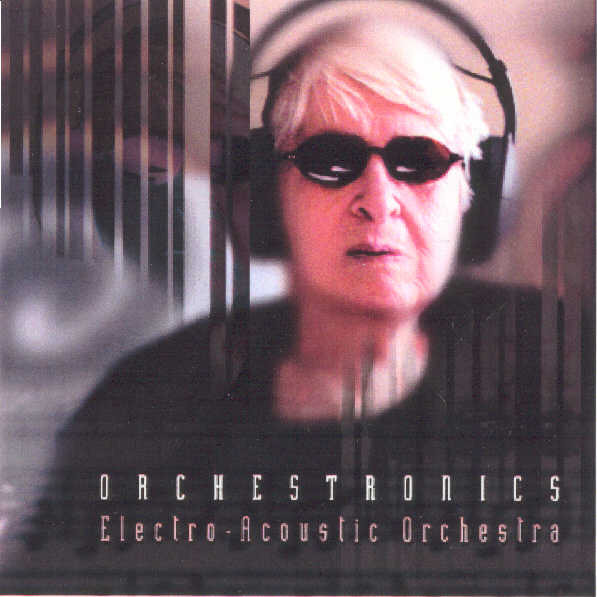 ...Orchestronics blends acoustic and electronic instruments to create a new form in contemporary music. The cumulative effort is so well done that only experts can tell where one form stops and another begins. Except for the occasional identification of strings, entire compositions could just as easily be electronically or acoustically created. Producer and Orchestronics founder Joe Wiedemann says in the liner notes that movie music has prepared listeners for this hybrid form. He's right. While the pieces differ from one another, they become part of an aural environment that's easy to enjoy. Bulls & Bears chronicles the highs and lows of the stock market and is a celebration of Wiedemann's longstanding passion for electronic orchestra. Bulls & Bears is an album perhaps somewhat sparse in the technology employed, yet a very thorough one, even baroque in the composition. This trait stresses counterpoints and musical dialogues in the classical way; It alternates very different rhytms, it grows and decreases in a constant manner... It reminds the listener of the style favored by J.S. Bach himself in more than one sense, and distills, among strings and pianos, even despite its liveliness, a slight melancholy only dispersed in very concrete moments. Moments that, although it turns out to be a paradox, lead us to reflect whether this is a true musical masked ball. In the late 1960's, America and the world got its first taste of the electronic orchestra... thanks to the creative genius of synthesizer virtuoso, Wendy Carlos. Switched On Bach turned on a whole new generation of instrumental music lovers, who reveled in the fusion of electronic wizardry with classical standards. In the 1970's. it was Japan's Isao Tomita, who became a pioneer with his electronic interpretations of Claude Debussy's classic works on his novel Snowflakes Are Dancing release. 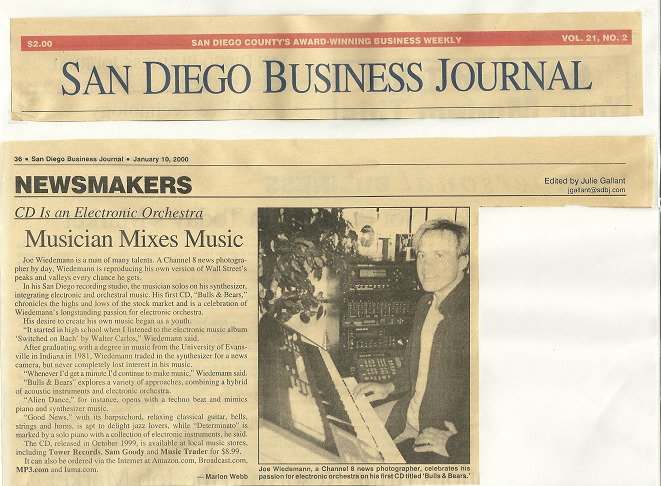 The mingling of orchestra and electronics continued in the 1980's and early 1990's with Synergy's Electronic Realizations For a Rock Orchestra and Sequencer albums. Composer Larry Fast dazzled synthesizer fans with an incredible style that has gone unmatched- until now. 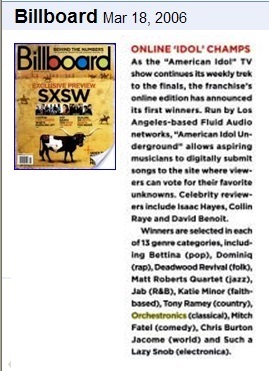 Bulls & Bears is a new CD release by San Diego-based Orchestronics. It's a creative, catchy, cutting-edge compilation of how advanced electronic music technology, can successfully blend with modern acoustic instruments. The Orchestronics orchestra easily dances through several musical styles. During its 11-track, 66-minute run, listeners are treated to selections in Classical, New Age, Smooth Jazz, Techno, and Electronica. Technically, the instrumentation is superb. Sweet oboe solos swell magnificently on many cuts. Violins weaved delicately through shuffling percussion movements, serve to inspire even the most discerning ear. The title track Bulls & Bears, opens with a driving beat, but settles down into a haunting oboe solo. It then takes off with rapid electronic sampling, and a forceful interplay between strings and drums. There's even a nod to the early synthesizer sounds that would have made Robert Moog very proud. It ends with a joyous mix of timpani, violins and winds, in a conclusion that leaves the listener inispired. Affections is a Tomita-sounding tune that is a touching, romantic selection evoking the sounds of heaven. There's a delightful battle between oboes and French horns. The solo piano work is reminiscent of New Age/Pop Crossover artist Jim Brickman. It's another breathtaking cut, demonstrating that electronic orchestras can do more than most polished musicians can do. A hypnotic techno beat dominates the beginning of Alien Dance. Listeners are transported into the universe with a galactic type of rhythmic energy. Piano and synthesizer mimic each other over a foot-stomping, head-bopping pulse. Good News is a track dominated by early David Benoit-style piano, with a bit of harpsichord thrown in for good measure. For the Smooth Jazz purist, the song also features Russ Freeman/Rippingtons-type relaxing Classical guitar. Bells, strings and horns are also used to break up the infectious rhythms. A patriotic and circus-like feel embraces Carny, which starts with a whistling synthesizer, and flows right into beautiful string work with a digital backbeat. A choral "voice" appears to add a dark, but fun side to the song. It wraps up by returning to the original calliope-sounding beginning. Autumn Night Breeze features so much variety, it boggles the ear. "Voices," a la Enya, are flowing over a swelling soundscape that invokes memories of Italian Techno composer Robert Miles' Dreamland CD. There's a howling reverb effect, followed by rapid Classical guitar licks. 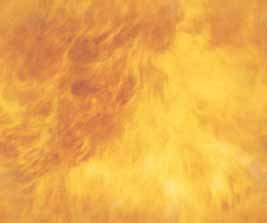 Vibrant, heavy and commanding, sums up Classical Equity. It has an urgent, pulsating beat, backed by a plucky string section. Exalting French horn, and a confident oboe solo, make this track refreshing and memorable. Rapid keyboard work by the Orchestronics leader is innovative and unreal. Two at a Time, Please! sounds like it might be a score for the cartoons of the new millenium. It's got a cat-and-mouse feel, with tasty duets between flutes and strings. Fans of Wendy Carlos will love the rivalry between oboe and synthesizer. It's just a FUN cut to enjoy. For Classical music fans, Orchestronics has reached new levels with the three-part Concerto No.1 for Piano and Electronic Orchestra. Determinato, the first movement, is marked by a solo piano playing with a collection of electronic instruments. It's a bright battle that's actually won by the acoustic and synthesized sounds. The second movement, Eleganza, is a wonderfully balanced piece. There are sneaky twists and turns that are surprising and incredibly gifted. Finally, Vivo, the third and final movement, combines all the sounds of the traditional orchestra, brilliantly fused with what sophisticated electronics can produce. The colors truly complement one another. It's a triumphant treat for the imagination. 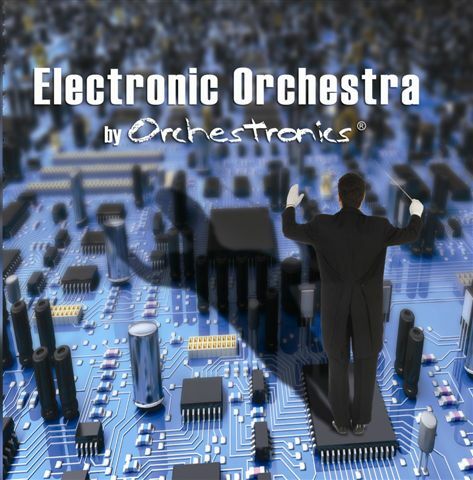 If you're looking to be mesmerized by available music technology, but are afraid to give up on historical orchestrated sounds, you won't be disappointed by Orchestronics. It's fresh, inviting, and yes, even ancient. Simply, it's unforgettable music that will blow you away. If there's going to be a defining tone that opens up the next century, this is it. Orchestronics will be setting the standard for musicians and audiophiles who love to have their ears challenged, and their souls and minds massaged. 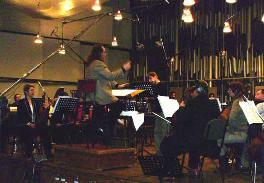 Orchestronics, Electronic Classical Music Recordings and Sheet Music.